The grizzly bear is the meanest animal in the forest. It can terminate the life of any other creature with one swipe of its paw. There is one animal that the grizzly bear will not attack. He has even allowed this animal to eat with him, even though it is his adversary. The animal is the skunk. 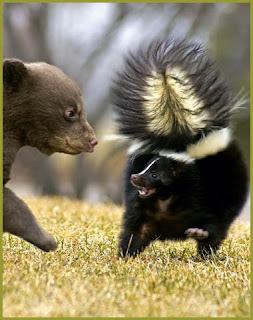 The grizzly bear does not like the skunk, but he has decided it is better to coexist with him than to create a stink! Sometimes it is better to learn how to get along with the skunk in your life than fight him and make your situation even worse. Dear Lord we pray that we will have the strength to get along with those around us even those that are hard to love. In Jesus’ name, Amen.